Joakim Orton’s late-season garden strip in full bloom. Photo and caption by Kelli Case. Joakim Orton moved into his Sugarhouse apartment in 2016, and since then he’s been cultivating a garden in an unlikely spot. Even though traditional gardening space is limited around his apartment building, he got creative and chose to utilize a long, thin strip of earth that lines the driveway—a spot most others would overlook. Before he began cultivating the space, it was bare with a few weeds. 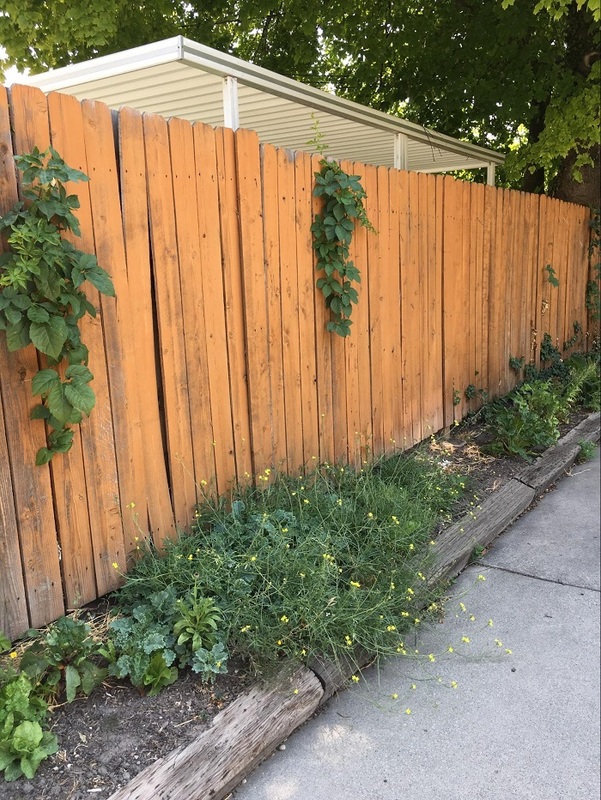 In the slightly awkward 300 square foot “garden bed” (approximately 2.5 x 120 feet), he grows arugula, tomatoes, carrots, onions, swiss chard, kale, nasturtiums, bee balm, rosemary, lemon balm, mint, orach, lettuces, sorel, bloody dock, mizuna, tatsoi, sunflowers, and wildflowers. “I made the garden so I could have access to fresh salad greens and vegetables, ultra-locally and in close proximity to my home. That way I’m first going to my garden for produce before other local sources,” Orton said. 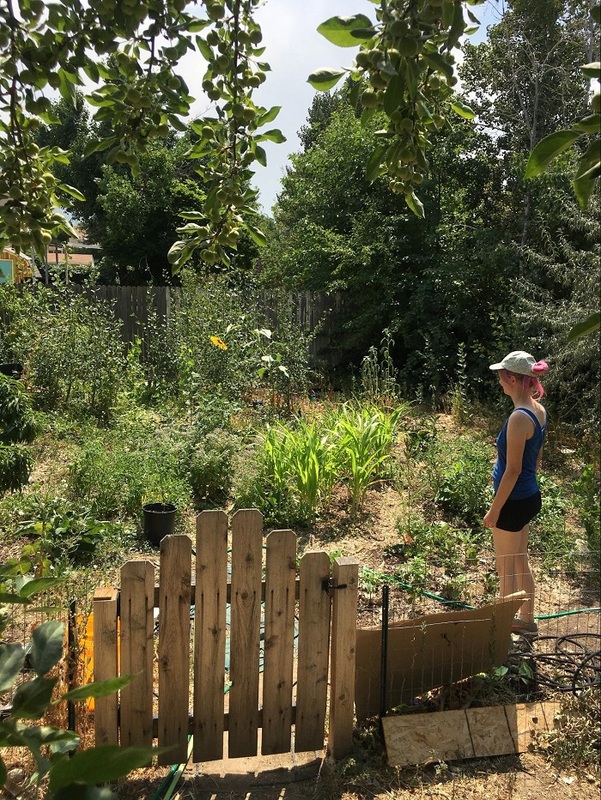 Kelly Hanks observes her organic backyard garden which used to be lawn. Photo and caption by Kelli Case. Kelly Hanks has turned 900 square feet of her yard into a dynamic garden with trees, shrubs, annual vegetables, herbs and flowers. It’s her fourth year gardening, so she’s beginning to reap a harvest on some of the trees she’s planted in year’s past: peach, nectarine, hazelnut and mulberry. Some of the annual vegetables she’s growing include drought-tolerant varieties such as purple hopi corn, wheat, jalapeno peppers, eggplants, pumpkin, zucchini, runner beans, goose bean, potatoes, borage, sunchokes and one mammoth sunflower. For Hanks, the garden brings unexpected joyful moments. “I was working in my garden at night with a headlamp on and came upon a fluffy bumblebee sleeping in my blooming mammoth sunflower,” Hanks said. Hanks emphasized that she keeps it as low-maintenance as possible by mimicking a natural ecosystem. She incorporates multiple layers that you’d see in a forest, with trees, shrubs and lower-laying annuals. She also keeps a good layer of mulch to encourage water storage in the soil. 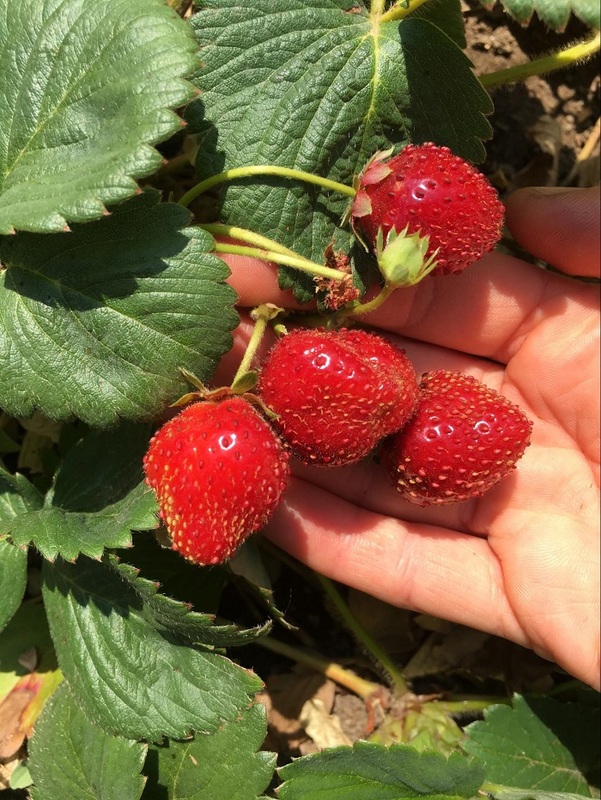 Maomi Cundick shows a few ripe strawberries growing in her garden. Photo and caption by Kelli Case. Since 2014, Michael and Maomi Cundick have been converting and cultivating every inch of their 1/8th acre yard into what they call an urban ‘forest garden.’ Theirs is an epic example of what’s possible in a suburban environment—the real big kahuna. To optimize the space and their resources, they incorporate a variety of water-wise tactics. Most of the garden is irrigated by a drip system, but they also have a rainwater catchment system from the roof where rainwater runoff is funneled into two 50-gallon cisterns so not a single drop of water that falls on their roof is lost. They’ve also installed swales to catch rainwater and direct it into a sloped section of the garden. Swales are shallow trenches dug along the contour of the earth which slow the flow of water through the landscape. In addition to swales, there is also a hugelkultur bed, which is a combination of tree branches, sticks, tree bark, wood chips, compost and soil. As the parts decompose, the resulting soil is similar to that of a forest floor with significant microbial diversity and the capacity to optimize water and nutrient storage. Across the garden, heavy mulching prevents water evaporation from the surface of the soil. By selecting drought-tolerant species that still produce excellently, they’re able to water less with the same results. The Cundick’s practice “beyond organic” gardening, meaning they don’t use any harsh chemicals or even purchase organic fertilizer or pesticides. They rely instead on other methods to add nutrients such as nitrogen to their soil. In addition to compost, they apply compost tea throughout the year and plant nitrogen-fixing plants such as Siberian pea shrub and buffaloberry. To manage pests, they plant fragrant species like tansey that deter problematic insects. With a focus on polycultures, which means growing a variety of species rather than only one like turf grass, they invite biodiversity into their garden. They also create ‘guilds’, which is when several species are cultivated together for the multi-yield benefits provided by their interactions. For example, in one section, they’re growing chives and currants near the base of a peach tree. They also focus on perennial crops which come back year after year and often require less work overall. A few perennials growing in their forest garden are raspberries, strawberries, comfrey and hazelnut. On site is a small pond which is home to various plants, fish, and a turtle named Harold. The pond also provides a cool spot for birds and insects to rest and have a drink. Their three chickens cycle nutrients by eating scraps from their kitchen and even from a few local restaurants. Near the chickens are thermophilic compost piles which process rather quickly, sometimes in as little as three weeks. The compost never finishes completely, so rather than spending hours sifting out the larger pieces, it can be finished by adding it to the worm pit, which is simply a hole they dug in the earth and filled with red wiggler worms, scraps and soil. To help with pollination and the production of honey, the Cundick’s also keep bees. As demonstrated by these urban gardeners, there are a wide range of projects possible. All that’s required is some creativity, resourcefulness and a willingness to get started!